People are so good. Deep down, when it matters, when the superficial is wiped away- people are good. On Valentine’s Day (fie! hiss!) Bean came home from school in tears, dejected and distraught. 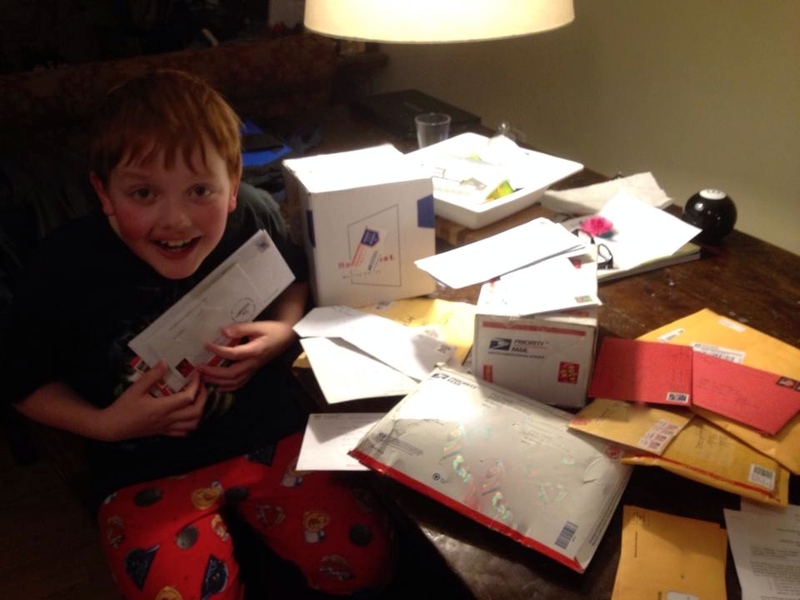 He’d carefully signed his name to 24 little paper Valentines for his class party, and in return, he received…. nothing. 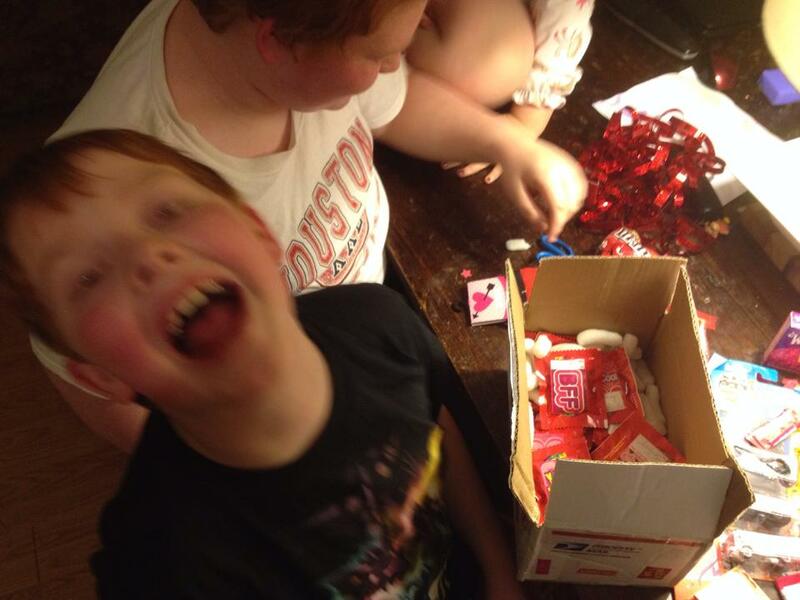 Abby had her overflowing paper-covered box, filled with pink and red hearts and treats. Bean had his carefully made box- a pencil-drawn monster-face with an open mouth cut for the Valentines to be deposited- but there was not one Valentine. He curled up on the couch, hiding his face in a pillow, whispering “I don’t have any friends.” This is a recurring issue for him (and honestly, for a lot of SpEd/ASD kids- socializing is hard.) and I reassured him that he was loved and had friends. I put up a small note about it on social media, and within minutes, people were asking if their kids could send him a Valentine. This… this is what good people, literally from all over the country, did for one sad boy: Hand-drawn, store-bought, treat-ladden, or simple cut construction paper- every one bearing a message of love and friendship for one boy, whom most of you have never even met. There were even three hand-made Doctor Who cards and a letter from the Doctor himself, addressed to Bean. 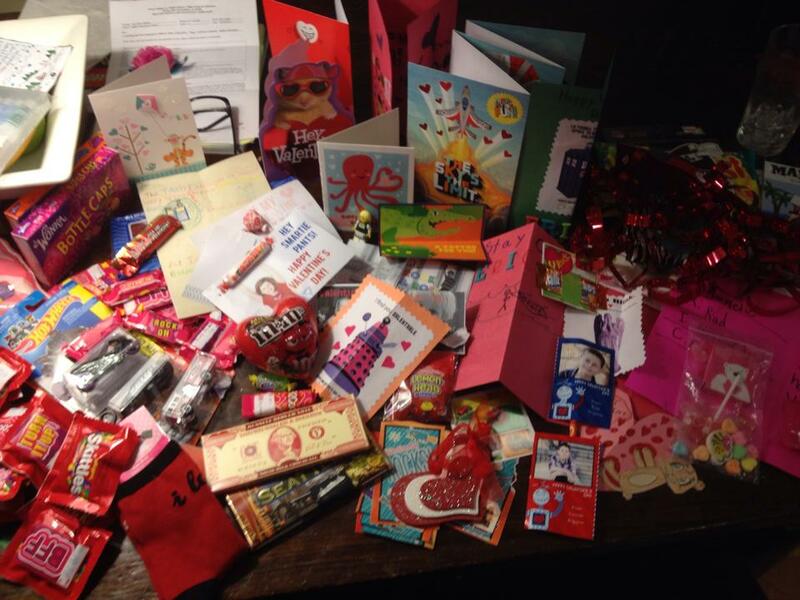 There simply aren’t words for this kind of outpouring of love. After some investigative work on my end, it seems there was an oversight, and his name was left off the main class list. He divides his time between several teachers, and it was just an accident. I’d say he’s gotten the better part though. Last night, as I was tucking him in bed, he wrapped his arms around my neck from the top bunk, and said “Mom, I guess I DO have friends. Lots of them!” This is something that will likely have long-reaching ripples in his life. Thank you all. Deeply and with all my heart. People are so very good.